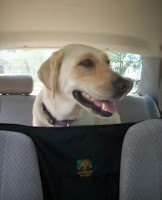 All Things Dog Blog All Things Dog Blog: Pet Auto Safety Means No Loose Dogs Up Front! No Loose Dogs Up Front! Tanner is a Clown on Easter Sunday! Tanner and Oliver regularly visit our local doggie daycare for play days where they enjoy all day free play. Often other owners comment on my industrial strength seatbelt harnesses,that secure the boys in the back seat and assure that I don't have an accident while trying to drive with one (or even two!) dogs attempting to join me in the front. I've written about these wonderful crash-tested dog seatbelts before, so today I'd like to introduce you to some other options for keeping your dog out of range of your safe driving, each offered by my sponsor, Pet Auto Safety. Owner Dawn is a plethora of knowledge on options for keeping your dog out of troublesome situations. Now that Oliver is a full-fledged adult, he enjoys riding with Tanner and being a 'big guy', when we take longer drives. Oliver is now outfitted with a crash-tested seat belt like Tanner's (but way, way, way smaller!) and the two are quite a sight in the back of my Prius. They definitely know that the car means adventure, even if it is just to the bank drive through where dog treats always arrive in the returned tube. What's not to love about that?!! Now let's look at some other ways to keep you and Fido safely separated while you drive. Front seat barriers used to only be found in police vehicles. Fortunately the pet industry has wised up and many are now available to keep your dog in the back seat. 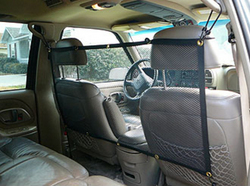 The Pet Net Car Safety Barrier is an inexpensive way to keep your dogs in the back of the car, while also providing a barrier to prevent them from shooting through the front window in case of an accident. It is easy to install and provides great visibility, working well for both owner and Fido. Outward Hound also makes a front seat barrier that is lower, thereby making it better for medium to small dogs. Its most important job is to keep your pup from climbing onto the front console and into your lap; it requires a console to be used properly. While you're waiting on the giveaway to start tomorrow, drop in and get acquainted with Pet Auto Safety. I'll share a picture of Dawn and her pups tomorrow also. What a nice fido family! You'll find them on Facebook and Twitter. 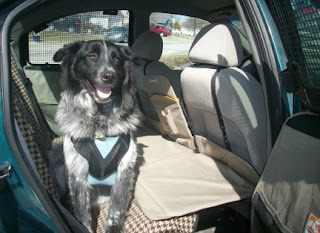 In fact, for those of you who prefer the 'sure thing' method of getting your dog's travel safety buttoned up, you can take advantage of PetAutoSafety.com's Discount Code: petsafeblogger, on orders at their website. This Discount Code saves you 10% and applies exclusively to harnesses, all pet car barriers and car seats. Full disclosure: Pet Auto Safety provided us with a seat belt to properly fit Oliver for crash-tested safety in the back of my car. I am highlighting this and some other products offered by this online pet safety supplier at no cost to them, and I have not been paid to provide my opinion or this review. No purchase is required to enter the giveaway that is coming soon. What a great post on pet safety in the car. We always need to remember to keep our pets and us safe when driving! This is a great topic. You've explained the options so well. Kelly happily stays in the back seat, but I have been weighing options of getting her a harness and seat belt. About dog seatbelts -- do they do a different size/shape for every breed, or are they designed for rough sizes, or is it one-size-fits-all? Terrific post Carrie! I totally agree and shiver when I see loose dogs in other cars.